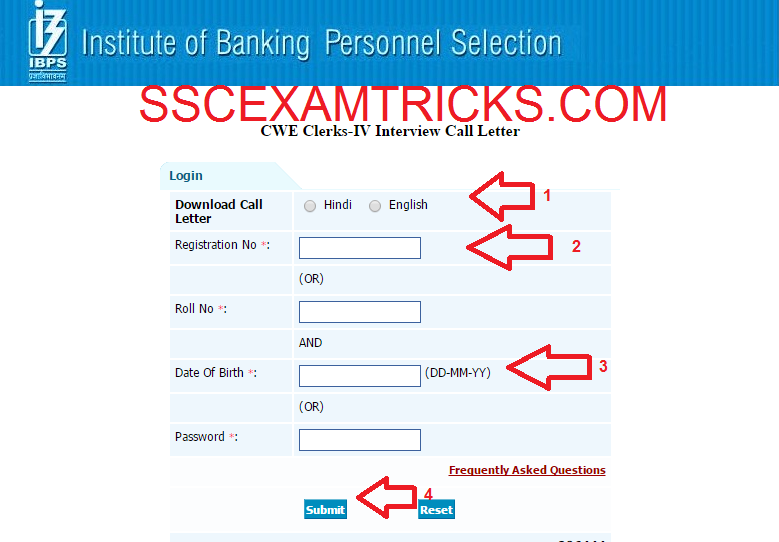 Institute of Banking Personnel Selection (IBPS) has released Interview Call Letters for the short listed candidates in written examination (CWE IV) which was held on 6th, 7th, 13th, 14th, 20th, 21st 27th December 2014 for the Clerks of Probationary Officers at various centres in all over the country. A huge number of candidates had qualified for the exam. Those candidates who have qualified the exams in the exam and waiting for the interview letters of IBPS CWE IV CLERK exam can download their interview letters from the direct link provided below. · Choose your language to download Interview Call Letter. · The Interview Schedule will be displayed on the screen. IBPS CLERK Exam was conducted on 6th, 7th, 13th, 14th, 20th, 21st 27th December 2014. The IBPS CLERK Exam was conducted by ONLINE MODE. The exam was entertained through filling of circles on Computer Generated Page (OMR sheet) containing answers by clicking by mouse on it. There was no OMR sheet needed to be filled by Blue/Black ball point pen. The exam consists of various sections English, Reasoning, Quantitative Aptitude, General Awareness and computer Intelligence. The exam was a multiple choice question paper of 200 questions of 200 marks and five options were provided out of which candidates need to choose one correct answer. The time duration was of 2 hours or 120 minutes. For more information candidate must download syllabus and exam pattern of IBPS CLERK exam from the official website. The qualified candidates of IBPS CWE IV Exam 2014-15 will be called for 2nd stage which is interview stage. Three times more than required candidates are called for Interview Round. Document verification will be done before Interview. · Valid system generated printout of the online application form registered. · Photo Identify Proof such as voter Card ID, Driving License, PAN Card etc. · OBC Certificate should be in proper format and issued by competent authority with in one year after date as mentioned in the advertisement. The Final Selection will be done on the basis of performance in the interview of the candidate. The interview will be conducted of 100 marks. The minimum qualifying marks will be 40% for General Candidate and 35% for SC/ST/OBC candidates. A Final Merit List of Finally Selected Candidates based up on the performance in interview and written exam marks will be released on the official website of IBPS. The Final Allotment will be provided in the month of April 2015.